All three aims, of character development, physical conditioning, and appropriate technical exposure apply to Karate Kids classes. However the content, aims and methods are modified to be appropriate for kids. Our aims are for shy kids to learn to speak out, for boisterous kids to learn to discipline themselves, and for all to become more respectful and courteous outside the training environment (dojo). The karate kids curriculum is modern kids karate (sport-based), plus basic self defence techniques appropriate for their age. 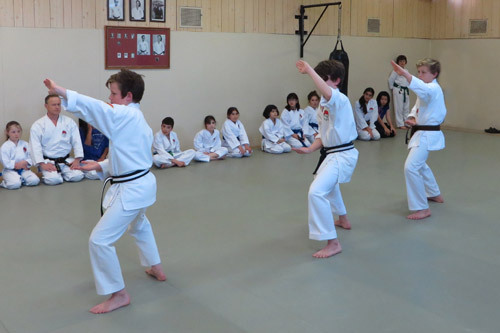 Karate kids are trained to develop a high level of skill in non-contact sport karate. When it is time to hit something, we hit punch bags and impact bags. However, our Karate kids are trained and encouraged not to hit or hurt others. Classes are conducted by Paul Tomassini, 7th Dan black belt, with over 35 years of karate teaching experience, including 25 years with “karate kids” 6-12 years of age.